This book brings to life a terrible and momentous time in British history. It begins on the eve of the First World War, in 1914. These days are seen through the eyes of John Brough, a farm worker and the author’s father, whose diaries chronicle pre-war rural life. These were the days of manual labour and ploughing with horses, long days of hard toil, yet the diaries reflect John Brough’s joy in the countryside around him. With band practice and chapel-going in his spare time, it was a secure, familiar way of life. Yet, after the Great War, rural life would never be the same again. Indeed, John Brough never returned to the family farm. 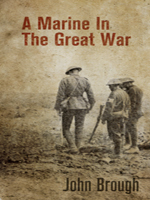 As war is declared, John Brough was plunged amongst the horrors of trench warfare. The book tells of the disaster of Gallipoli, the carnage of the Western Front, chronicled by a number of different voices. Then John Brough’s diaries resume, taking us through the daily life of a prisoner of war, enduring starvation rations and hard labour down a coal mine. He endures sickness, the death of companions and theft by desperate co-prisoners of his meagre food rations. Yet he still finds pleasure in an unexpected food parcel, a fine day, and a friendly gesture from a comrade in arms.